Taking their inspiration from the spherical wheeled Audi RSQ concept seen in the Will Smith film, I, Robot, a group of students at the Charles W. Davidson College of Engineering at San Jose State University have created a similar concept, but with just two wheels. 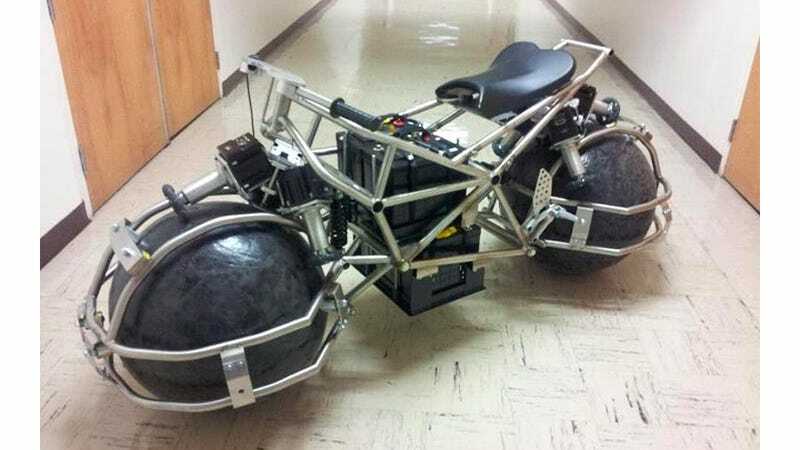 Besides an eco-friendly electric drivetrain, the bike's spherical drive system is promised to be safer than a traditional motorcycle since the front wheel can't suddenly turn sideways and jackknife, leading to a crash. And those giant spherical wheels—made from carbon fiber and fiberglass covered in industrial rubber—make maneuvering and parking an absolute breeze since the bike can move sideways just as easily as it can move forwards and back. The students hope to have the concept fully assembled and running by the end of the year, but whether or not such a design would ever go into production remains to be seen. And while it's great they're remaking the car from I, Robot, couldn't they have fixated on The Fifth Element instead? I want my flying taxi!